The Fold escorts the reader into a suspenseful journey that provides healthy doses of mystery, fringe science, and Lovecraftian horror. Our hero in The Fold is a Sherlock Holmes-ian character with an eidetic memory who's recall and powers of observation become an integral part of the plot as the story unfolds. Cline's exploration of fringe science, easily relatable characters, and his healthy respect for geek culture make The Fold a fun, entertaining, and exciting read for science fiction lovers. Admittedly, this is my first exploration into Cline's work but I will definitely be reading more in the near future. I love this series! Cibola Burn is a wild ride into the massive universe of James S.A Corey's Expanse Series. Alien tech, a completely foreign planet, and a security chief with no regard for human life provide the latest challenges for Jim Holden and his crew aboard the Rocinante. Cibola Burn is a hard-hitting, action-packed adventure that you can't put down. James S.A. Corey knocks another one out of the park! Abaddon's Gate expounds upon Jim Holden and the crew of the Rocci as their fate seems inextricably bound to the protomolecule's mysterious construction. Politics, religion, and ghosts from the past continue to complicate Holden's life in Abbadon's Gate as a new era of human expansion looms on the horizon. Despite the fact that Caliban was not written by Issac Asimov, it holds true to his style and tradition. We see Asimov's tried and true method of storytelling in the elements of futuristic crime solving-- a la Elijah Bailey-- and the application of the three laws. Where Allen shines in the storytelling of Caliban is the development of the New Laws and the ultimate robot, Caliban, who exists with no laws other than the laws he creates for himself. A great read for fans of Asimov! Fantastic Read! Old Man's War draws the reader in so successfully that I couldn't put the book down. Scalzi provides the reader with a wondrous ride through his universe of limitless possibilities with loveable and relatable characters who feel like old friends. Scalzi's well-developed characters, richly creative plot and well-imagined alien races provide a robust story-telling experience with a refreshing and captivating originality. Highly recommended! Dark Eden is a wonderfully unique novel written from the perspective of an accidental colony on a wholly alien world. The world itself appears to be a rogue planet with no nearby star to provide warmth or light, but is livable due to the volcanic nature of the planet. The indigenous animal life has evolved mechanisms to produce bioluminescence and the indigenous flora has evolved to produce both heat and light. The accidental colony of humans have been living on Eden's surface for over five generations in the hopes of Earth's return. The civilization is a primitive hunter-gather culture that is deeply set in its ways and firmly entrenched in the stories of the first people who came to Eden. The people of Eden are clustered around a small and sacred area where the landing craft sat down years before. In their sacred stories, it is said the people of Earth will return and take them back to Earth. I was emailed by the author and asked to provide an honest review of Fools' Apocalypse. Fools' Apocalypse provides the reader with a first-hand account, from multiple perspectives, into the end of civilization as we know it. The author takes the reader down a twisted path of conspiracy theory politics and religious extremism into the quagmire of a world-ending doomsday scenario wherein each of the main characters plays their own unwitting part in bringing civilization to its knees. The novel draws upon the themes of The Walking Dead, focusing on the elements of survival in a post-apocalyptic setting, as the characters come to terms with the cumulative effects of their individual actions. As a long-time lover of Norse Mythology, I have to say I'm excited about Neil Gaiman's new book. relevance to the stories that helped define us as a species. 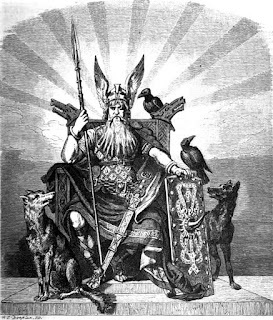 Norse Mythology holds a special place for me because of the very personal connection I have always felt to the stories, culture, and indeed the Norse Gods themselves. For those who share my interest and love of Norse Mythology, I thought I might share some other books I have enjoyed over the years that bring deeper insights into the culture, stories, and traditions of our Nordic ancestors.